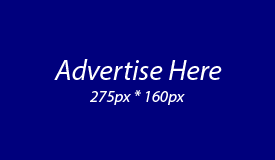 PHILIPSBURG:--- The Supervisory Board of Directors (S.B.O.D.) 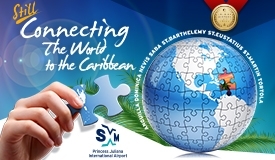 of the Princess Juliana International Airport (SXM) hereby announces the resignation of the Chairman of the Supervisory Board of Directors, Johan Alex Dijkhoffz. The announcement was declared by Mr. Dijkhoffz at the Supervisory Board of Directors and Management Board meeting on Friday, April 12, 2019, at the Carl’s Unique Inn Conference facility. In conjunction with the resignation process, the outgoing Chairman has also forwarded a statement to the honorable Minister of TEATT, Stuart Johnson, announcing that his resignation will be effective as of Tuesday, April 30th, 2019. The Vice Chairman, Michel Hodge will temporarily assume the responsibility as the Acting Chairman of the Supervisory Board of Directors effective immediately. Johan Alex Dijkhoffz was a member of the Princess Juliana International Airport Holding and Operating company since 2017. On behalf of the Supervisory Board of Directors, we would like to extend our gratitude to Mr. Dijkhoffz for his years of service and commitment at the Princess Juliana International Airport (SXM). 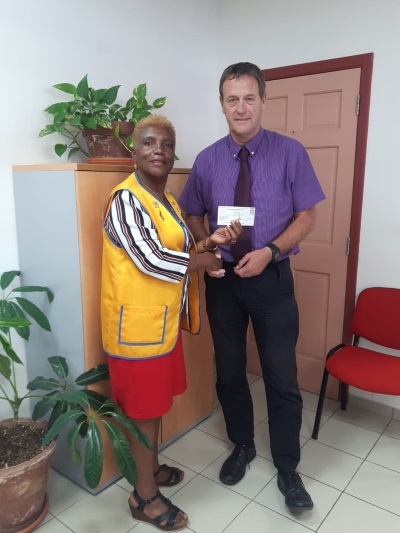 PHILIPSBURG:--- Mr. Wim De Visser, the director of MPC and Sundial schools, received a cheque of US$ 550.00 from the St. Maarten Lions club towards the annual Milton Peters College annual Extreme Survival activity. The donation is towards purchasing the t-shirts as they host their 15th, Extreme Survival. Over the past years, the Sint Maarten Lions Club has donated towards the MPC Extreme Survival activities. We started out years ago by preparing sandwiches, oranges, and drinks for the participants and today, we are happy to assist with purchasing the t-shirts for these years’ participants. The event is planned for Saturday, April 13, 2019. The Lions club wishes the participants much success. PHILIPSBURG: --- The Internal Auditor of Government-Owned Utility Company GEBE Sharine Daniel has been sleeping on the job and have been covering up for the Chairman of the Supervisory Board Bienvenido Richardson. SMN News understands that Members of the former Supervisory Board were each given a check of $4,000.00 as they were preparing to go to Bangkok to conduct research on renewable energy. The trip was intended to take place prior to hurricane IRMA where the members of the Supervisory Board and Management team were heading to Bangkok. Each of the persons that were supposed to go on that trip was given $4,000.00 for hotel accommodations but that trip had to be canceled due to the passage of hurricane IRMA. SMN News further learned that when GEBE management asked the members of the Supervisory Board to return the check they were given since the trip was canceled the only board member who had already cashed the check was the chairman Bienvenido Richardson who told several tales about the check, one of those tales was that the check blew away by the strong forces of hurricane IRMA which were in his briefcase. Sources say when GEBE management told Richardson that they would cancel the check only then he changed his story to say that he had already cashed the check and that it was the cash money that blew away. 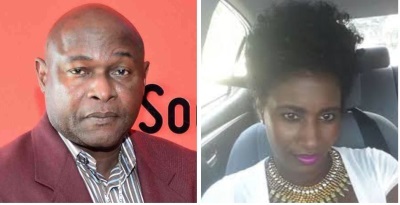 SMN News further learned that Richardson was given several options to repay GEBE one being the payment could be made in installments but since the Internal Auditor Sharine Daniel is very close to Richardson she never made any effort to ensure that the company gets back its money. SMN News further learned that Richardson even got an extra laptop from GEBE since he claimed his laptop was stolen which also turned out to be a lie. Workers at GEBE said that Daniel who is supposed to conduct checks and balances at GEBE but she has become very lackadaisical with her core duties and has been performing all the work for the Supervisory Board members that are deemed unfit for their duties. “Can you imagine Richardson would not send out an email or letter if it's not written by Sharine Daniel. Daniel expects that the current Supervisory Board will appoint her as the next Chief Executive Officer since the contract for the three members of the management team will come to an end by October 2019. While Daniel is the Chief Internal Auditor of GEBE where she is a permanent employee, she is the Chairman of the Supervisory Board of SZV where that entity is in total chaos since Daniel has not been doing her supervisory job there either. Daniel is also a member of USM board. Questions are being asked about Daniel’s role with the Supervisory Board of GEBE who is also supposed to supervise her performance and her closeness to certain politicians that can grant her favors as she strives to take down other locals for her own self-interest.